Astronomers studying the Vela pulsar wind nebula with ESA's INTEGRAL observatory have successfully resolved its morphology in the hard X-ray band, for the first time. This pulsar-powered nebula is the most extended individual source yet observed at these energies. The study exploited a special imaging technique to reveal a new component of the source that likely consists of highly energetic electrons that have escaped from the core of the nebula in the last few thousand years. 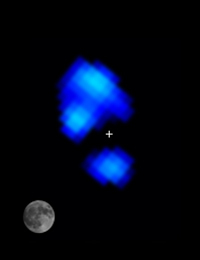 All-sky image obtained with INTEGRAL at hard X-ray energies. The Vela pulsar wind nebula is shown in the insert. Credit: All-sky image: ESA/INTEGRAL/IBIS/F. Lebrun/CEA, Saclay; Insert: ESA/INTEGRAL/IBIS-ISGRI/F. Mattana et al. One of the milestones in modern astrophysics was the discovery, in the late 1960s, of the Vela and Crab pulsars. These pulsating sources were the first of their kind to be detected within the remnants of supernova explosions. By providing the first evidence for a causal link between the then recently discovered class of sources and the demise of massive stars, these observations clarified the nature of pulsars: rapidly spinning and strongly magnetised neutron stars. Like all pulsars powered by their own rotation, the Vela pulsar gradually releases its rotational kinetic energy by driving a steady wind of highly energetic electrons and positrons. Pulsar winds create clouds of charged particles, known as pulsar wind nebulae (PWN), that radiate energy across the electromagnetic spectrum and are thus observable in several bands. During its early phases, the highly pressurised PWN expands at high speed in its denser environment, which consists of ejected material from the supernova explosion that created the pulsar and swept up material from the surrounding interstellar medium. This structure, known as a supernova remnant (SNR), in turn expands into the diffuse interstellar medium. Interactions between the expanding components produce a number of interesting effects affecting the dynamical evolution and, subsequently, the morphology of PWN. Image of the Vela pulsar wind nebula obtained with INTEGRAL at hard X-ray energies, between 18 and 40 keV. The angular size of the full Moon is shown for comparison. Credit: ESA/INTEGRAL/IBIS-ISGRI/F. Mattana et al. At a distance of about 900 light-years, the Vela PWN is one of the nearest of its kind and thus offers an opportunity for detailed investigations. It has been studied extensively at X- and gamma-ray energies, as well as in radio waves. A recent study led by Fabio Mattana from the Laboratoire APC – AstroParticule et Cosmologie, Paris, France, has used data from ESA's INTEGRAL mission to image the Vela PWN at hard X-ray energies, between 18 and 40 keV. By resolving a PWN at these energies for the first time, the study opens up a new and revealing spectral window on these intriguing objects. Multiwavelength observations of a PWN help to sample populations of particles with different energies that exist in the cloud. In particular, X-rays are released by electrons as they move along the pulsar's magnetic field (synchrotron emission); in contrast, gamma-ray emission arises from a different physical mechanism: the energy boost that synchrotron photons experience when they scatter off electrons (Inverse Compton emission). This means that, somewhat counterintuitively, the most energetic particles in a PWN are revealed by observations in the hard X-ray, rather than the gamma-ray, spectral band. 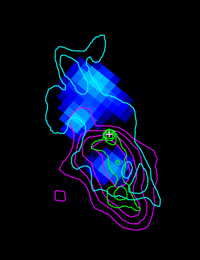 "Since the most energetic particles in a PWN are the ones with the shortest lifetime, our observations of the Vela PWN in hard X-rays provide a fresh look at this source's recent history," comments Mattana. The study used data from the IBIS imager on board INTEGRAL and applied a special data analysis technique that was developed in 2006 to further exploit the capabilities of the instrument. Originally optimised to study point sources, with this method IBIS is also suitable for the observation of extended sources and the characterisation of their morphology. The Vela pulsar wind nebula in the X- and gamma-ray bands. "Besides confirming the results of previous observations of the Vela PWN, which showed a cocoon-shaped cloud to the south-west of the pulsar at soft X-ray and gamma-ray wavelengths, the new INTEGRAL image reveals a previously unknown component at a rather unexpected location, north-east of the pulsar," Mattana adds. The well-known asymmetric structure of the Vela PWN, with the 'cocoon' on one side of the pulsar, is typical of an evolved PWN. This object is in fact a prototype of PWN undergoing this phase of their evolution. As the expanding SNR sweeps up material from the surrounding interstellar medium, it produces two shock waves, moving outwards and inwards, respectively. When the latter, known as the 'reverse' shock, eventually hits the boundary of the PWN, a few thousand years after the supernova explosion, it compresses and distorts the cloud, giving it a chaotic and filamentary structure. In the process, as a consequence of the SNR expansion into an inhomogeneous interstellar medium asymmetries in the cloud shape and displacements of the PWN with respect to the pulsar often arise. The newly detected component, seen only in hard X-rays so far, can also be explained as an effect of the reverse shock. "We believe that the newly-revealed region is a 'recently' born cloud, consisting of particles that have been injected by the pulsar after the supernova reverse shock has 'wiped away' the pre-existing nebula from the pulsar surroundings," explains Mattana. "In this case, the displaced lobe would only be populated by freshly injected particles, released by the Vela pulsar in the last couple of thousand years; these shine brightly at hard X-ray energies," he adds. This scenario is also consistent with the spectral analysis of data from INTEGRAL and from the Japanese-US Suzaku mission, also performed during the same study. Mattana and his colleagues hope that more clues about the nature of the newly-detected lobe will emerge with future observations of the source at lower X-ray energies, to be performed with ESA's XMM-Newton X-ray observatory and other facilities. This study presents the first INTEGRAL image of extended emission around the Vela pulsar in this energy range. With an angular size of about 50 arc minutes on each side, the Vela PWN is the most extended individual source observed at hard X-ray energies thus far. It is also the first time that the application of this imaging technique has allowed a detailed investigation of the source's morphology. "The result is a significant achievement for INTEGRAL and showcases the versatility of the instruments on board the observatory as well as the creativity of its user community," comments Chris Winkler, INTEGRAL Project Scientist at ESA. "With this technique, we have a new way to investigate the hard X-ray sky, and we look forward to its application to other sources, such as nearby supernova remnants." The study presented here is based on observations performed with IBIS, the coded-mask imager on board INTEGRAL, with its low-energy detector ISGRI, which is sensitive to the energy range between 15 keV and 1 MeV. As with all coded-mask imagers, IBIS does not produce images directly but via a reconstruction algorithm. The design of IBIS is optimised for the study of point sources in the hard X-ray sky and the standard reconstruction technique used to obtain images from IBIS data strongly concentrates on the portions of the sky where the radiation flux peaks. This has the disadvantage of centralising possibly extended sources at the expense of their flux, reducing them to apparent point sources with a tenfold dimmer flux. In order to employ IBIS to study extended sources, a novel approach has been developed to overcome this drawback. This method takes account of the telescope point spread function over the entire field of view in order to properly rescale the flux in the images. A correct image of the source over its entire angular extent is then achieved. The method has been developed by Matthieu Renaud (currently at Laboratoire Univers et Particules de Montpellier, France) and collaborators in 2006 and is described in M. Renaud, et al. (2006). INTEGRAL is an ESA project with instruments and science data centre funded by ESA Member States (especially the Principal Investigator countries: Denmark, France, Germany, Italy, Spain, Switzerland) and Poland, and with the participation of Russia and the USA.